The ARK Crypto Podcast | Listen Free on Castbox. 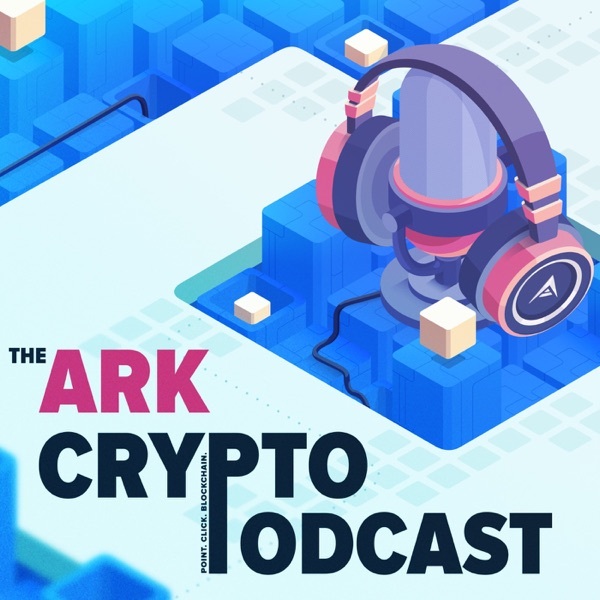 The ARK Crypto Podcast features news and insight regarding the ARK Ecosystem, a Blockchain based network running on ARK Core Technology. You can find out more at ARK.io. The thirty-fifth episode of the ARK Crypto Podcast is here! This week represents a huge leap for ARK as we release an all-new whitepaper. The whitepaper represents months of team-wide collaboration and years of achievement and progress. With this new whitepaper, the ARK community can rally around the vision of ARK, moving forward with deploying and using ARK technology with confidence.Part 3 is the final part of the whitepaper reading, and next week we are doing a "Community Questions and Nothing Else" episode. So, if you have questions about the whitepaper or ARK, let us know ASAP on twitter username ark_podcast, Instagram username thearkcryptopodcast, or on the special post coming soon to reddit.ark.io.This is the initial release of the all-new whitepaper to first receive community-wide feedback on the content. Once we get some of the initial commentary we’ll also start to integrate images and other eye-candy touches we have prepped for better understanding and visualization of the data, and make it more appealing for print format.Lastly, ARK will be running a community-wide contest surrounding the whitepaper soon, with Ledger hardware wallet prizes provided by ARK, and delegate-sponsored prizes as well. Stay tuned in with blog.ark.io for more details. Delegates who wish to add prizes to the pool may reach out to me (Justin) on Slack.The ARK community played a large role in the creation and release of this new whitepaper. Over the last 2+ years, your questions on reddit.ark.io, discussions with us on slack.ark.io, and unique perspectives are the driving force behind everything that we do. For this, everyone in the ARK team would like to give you our greatest thanks.Enjoy! The thirty-fourth episode of the ARK Crypto Podcast is here! This week represents a huge leap for ARK as we release an all-new whitepaper. The whitepaper represents months of team-wide collaboration and years of achievement and progress. With this new whitepaper, the ARK community can rally around the vision of ARK, moving forward with deploying and using ARK technology with confidence.This is the initial release of the all-new whitepaper to first receive community-wide feedback on the content. Once we get some of the initial commentary we’ll also start to integrate images and other eye-candy touches we have prepped for better understanding and visualization of the data, and make it more appealing for print format.Lastly, ARK will be running a community-wide contest surrounding the whitepaper soon, with Ledger hardware wallet prizes provided by ARK, and delegate-sponsored prizes as well. Stay tuned in with blog.ark.io for more details. Delegates who wish to add prizes to the pool may reach out to me (Justin) on Slack.The ARK community played a large role in the creation and release of this new whitepaper. Over the last 2+ years, your questions on reddit.ark.io, discussions with us on slack.ark.io, and unique perspectives are the driving force behind everything that we do. For this, everyone in the ARK team would like to give you our greatest thanks.Enjoy! The thirty-third episode of the ARK Crypto Podcast is here! This week represents a huge leap for ARK as we release an all-new whitepaper (https://ark.io/Whitepaper.pdf). The whitepaper represents months of team-wide collaboration and years of achievement and progress. With this new whitepaper, the ARK community can rally around the vision of ARK, moving forward with deploying and using ARK technology with confidence.This is the initial release of the all-new whitepaper to first receive community-wide feedback on the content. Once we get some of the initial commentary we’ll also start to integrate images and other eye-candy touches we have prepped for better understanding and visualization of the data, and make it more appealing for print format.Lastly, ARK will be running a community-wide contest surrounding the whitepaper soon, with Ledger hardware wallet prizes provided by ARK, and delegate-sponsored prizes as well. Stay tuned in with blog.ark.io for more details. Delegates who wish to add prizes to the pool may reach out to me (Justin) on Slack.The ARK community played a large role in the creation and release of this new whitepaper. Over the last 2+ years, your questions on reddit.ark.io, discussions with us on slack.ark.io, and unique perspectives are the driving force behind everything that we do. For this, everyone in the ARK crew would like to give you our greatest thanks.Enjoy! The thirty-second episode of the ARK Crypto Podcast is here! This week, something special is coming to the ARK Crypto Podcast. Ray Alva, a bar-certified lawyer and member of the ARK Community Committee, ARK Community Fund, and Delegate Echo is taking over the airwaves to deliver the first edition of the 'Blockchain Legal Roundup.' Ray will be utilizing his unique blend of knowledge in law and crypto to report and comment on budding legislation on the state, federal, and international levels.Ray's involvement with the ARK Crypto Podcast is not an endorsement by Justin or ARK.io to vote for echo. We do not endorse delegates, because you should always do your own research and make your own decisions on who to vote for with your ARK. You can browse delegates on the community website arkdelegates.io, managed by Delegate Deadlock. ARK.io does not run the ARK network.If you enjoy this special content, please be sure to let us know on Twitter at @ark_podcast, or on Reddit in the post for this episode at reddit.ark.io.Enjoy! ARK Crypto Podcast #031 - ARK Ecosystem Participation Checklist AgainThe thirty-first episode of the ARK Crypto Podcast is here! It's been over six months of wonderful episodes, but it's time to take a beat. If all you have been doing is listening, we appreciate it, but it's time to take more action! This is an interactive episode- be sure to have your desktop or laptop computer out and browser ready.This episode is a checklist you can refer to for ways to participate in the ARK Ecosystem as someone who has just recently discovered our ambitious endeavor. The checklist has nine items, and whether you're an ARK dabbler, an ARK fan, or a diehard 'deluded arkie,' there is probably something you aren't doing yet on this list.Enjoy! The thirtieth episode of the ARK Crypto Podcast is here! This week, we sit down for an exclusive interview with Calidelegate during the Crypto Blockchain Plug Launch Party in Inglewood, CA. Calidelegate even flipped the script on me and asked me some questions! Delegates appearing on The ARK Crypto Podcast do not constitute an endorsement by ARK.io or its agents to vote for a specific delegate. Always consider all the options when choosing a delegate to vote for by visiting arkdelegates.io, a community website managed by Delegate Deadlock. Voting rewards are voluntary, they are not part of the ARK protocol, and ARK.io does not run the ARK network.You'll also hear the special talk I gave to everyone at the party. Find the video of my talk at youtube.ark.io. You can learn more about The Crypto Blockchain Plug, attend more free events, and even become a member at blockchainpluginglewood.comEnjoy! The twenty-ninth episode of the ARK Crypto Podcast is here! This week, we continue our deep-dive into AIP-60. This ARK Improvement Proposal sheds light on permanent voting potentially posing an issue for network stability and delegates who may have an unfair advantage from voters who have lost their keys, for example. A fierce discussion ensued on both sides of the issue. In this episode, I assemble the main points both for and against a revoting mechanism, and casually discuss the implications of these points. If you were scratching your head after last week's episode, this week will bring even the average user some additional clarity. Have your own opinion? Go to the ARK Github at github.ark.io and make your voice heard, even if you don't write code. Simply scroll to the AIP section and enter it, then click issues and find AIP-60, with over 100 comments so far.Enjoy! The twenty-eighth episode of the ARK Crypto Podcast is here! This week, we address an ongoing discussion happening on The ARK Github, AIP-60. This ARK Improvement Proposal sheds light on permanent voting potentially posing an issue for network stability and delegates who may have an unfair advantage from voters who have lost their keys, for example. A fierce discussion ensued on both sides of the issue, and I also threw my hat into the ring with a unique idea. Follow along on github.ark.io in the issues section as I read the discussion between ARK community members, team members, and delegates. Have your own opinion? Go to the ARK Github and make your voice heard, even if you don't write code.Enjoy! The twenty-seventh episode of the ARK Crypto Podcast is here! This week, we dive into the archives to show just how far ARK has come. What has ARK been up to since its inception in late 2016! Get the big picture this week on The ARK Crypto Podcast. ArkTimeline.com is the source of all the information you will hear today, and you can even follow along on the website. I also provide some commentary and show you why these achievements are so important. Expect even more great work throughout 2019.Enjoy! The twenty-sixth episode of the ARK Crypto Podcast is here! This week I announce the winner of the ArkStickers.com sticker photo contest and provide closing details on Gonggrabber's 10,000 ARK video contest. We're also syndicating a presentation I gave for a virtual crypto conference hosted by Mainframe called DecentralizedSummit.com. In this episode, I give one of the most complete overviews of ARK to date. Hope you like it!Enjoy!